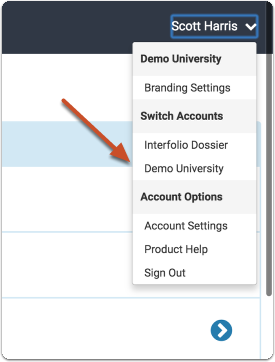 This article explains how to add new users to Interfolio Promotion & Tenure from the User & Group Management page. 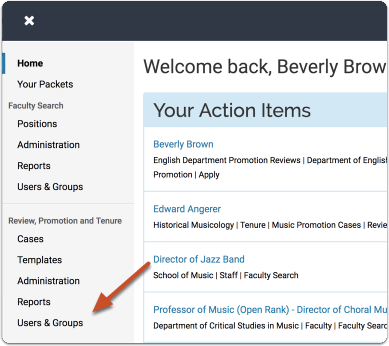 Administrators can add new users to the program from other screens as well, for instance, when editing committee membership from the case page. 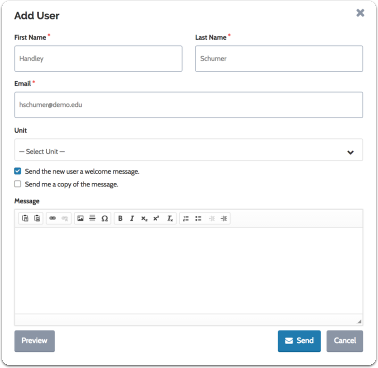 Also, If you need to add many users to the program at once, see the article "Add Users in Bulk." 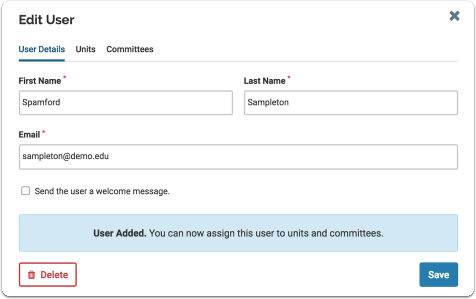 After adding them here; you will have the opportunity to assign the user to one or more standing committees, add them to other units, and set their permissions (user roles) within the program. 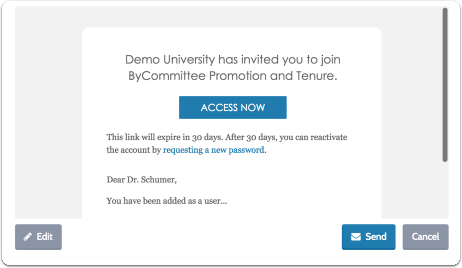 Note that this email invites the user to join the program and includes a link to activate the account. 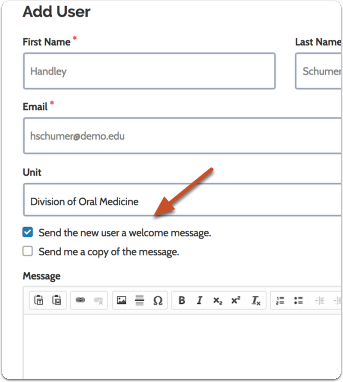 If the user loses this email, you can always resend the invitation email. 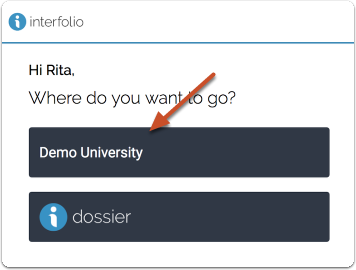 You can resend an invitation email again at any time from the "Edit User" window simply by sending the user a new email. See here for more information on how to resend the invitation email. 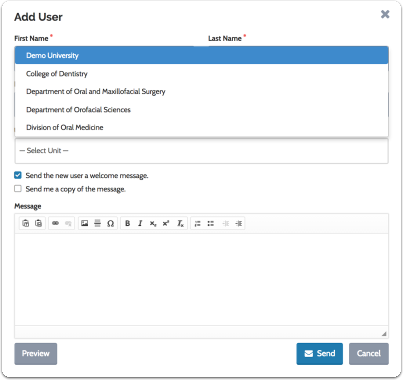 Once the user is created, the "Add User" window becomes the "Edit User" window, and you will see a tabbed interface where you can assign the user to units and committees. 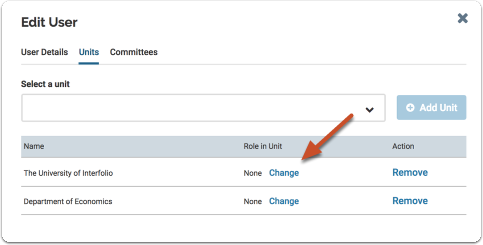 Open the "Units" tab, select a unit from the dropdown list and click "Add"
Click "Change" under the "Role in Unit" column. 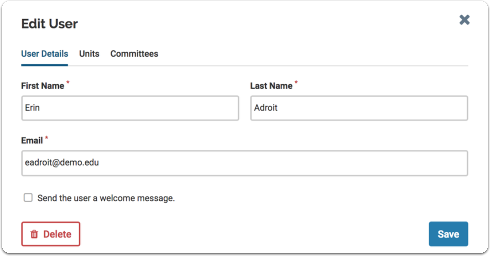 From the User & Group Management page, a user can only be assigned to standing committees, however, once added, they will appear as available for ad-hoc committees created within their respective unit. 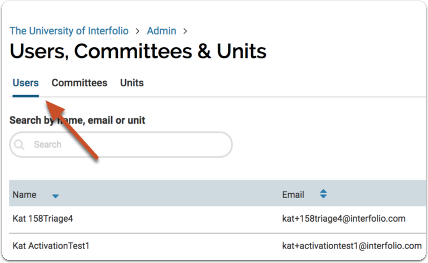 Select a committee from the dropdown list and click "Add Committee"
The default role is "Evaluator." Choose between "Evaluator" and "Manager"